April 30, 2009 In News What is Michelle doing now? Michelle Chaplow has been commissioned to photograph the North and South Courses of El Rompido Golf course in the province of Huelva , Andalucia Spain. The natural beauty of the course set amidst a landscape of marshland, umbrella pines, velvet type greens with accents of springtime yellow mimosa have been captured on camera. The photographic images will be used in publicity campaigns in both digital and printed media. Stock images from the el Rompido area shot by Michelle and published in her coffee table book “Espagne” will also be reproduced on El Rompido’s website. A selection of landscape and lifestyle images from this shoot can be viewed here. 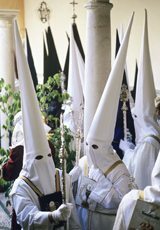 One of the highlights of the Spanish festival calendar is Holy week or Semana Santa. The Sunday Observer selected and published an image from Michelle Chaplow´s stock collection to illustrate a feature on Semana Santa in Malaga. This year Michelle is teaching and hosting a workshop which includes photo-journalistic coverage of this event. The course is fully booked and students are arriving from 3 different continents to study and practice photography with Michelle on site in Andalucia. The terracotta project continues and Michelle has found that once she started looking, she could see terracotta everywhere. She was particularly mesmerized by the rich red tones and superb ruby like hues found in the Rio Tinto. She reports, “It’s a huge kick to a photographer to stumble on something like this. I was returning from the golf course shoot and crossed the River Tinto, fascinated by its colours. I parked and found a route down to the river banks. The Rio Tinto is a fascinating red wine river where one colour portrays itself in hundreds of shades. I thought of the terracotta project and couldn’t resist capturing it on camera. Moments when nature evolves before your very eyes, humbly giving us more and more colours and subjects are indeed privileged. These are moments when time doesn’t exist willingly captivated by nature’s spell. Mimosa on the El Rompido South golf course. Sunsets on the El Rompido North golf course. Semana Santa in Malaga Image published in the U.K. Sunday Observer.